It's Red Nose Day in the UK on Friday and I have to wear red to work, it's not a colour I usually wear and I thought a few other people might be in the same predicament as me so I did a little polyvore collage of some great red items to give you some inspiration. The H&M vest is only £3.99 it's a cheap way to wear as bit of red on Friday. If you don't have anything red or any funds to get a snazzy red outfit then nail polish and makeup are a cheap way to bring a little red into your outfit. I really wanted one of the Vivienne Westwood Red Nose Day tshirts but they have sold out everywhere, such a shame! lovely red dress, that red dotty shirt dress in the picture is also lovely! That red dress looks lovely on you. I love that red dress! I've to wear red (either that or dress up - no thanks!) on Friday and I don't own *anything* red I don't think! Might have to treat myself to something new - any excuse! ;) We also got asked if we wanted to stay after 10pm and take calls for donations for a few hours but I had to decline since I'm working early on Saturday morning and feel I'd go crazy with such a short space between working! I wouldn't normally wear red either! Oh man, I've been obsessed with the brown version of the Topshop dress, didn't even know there was a red one, I love that one even more! Oh you look lovely in the red dress, the colour is great on you. The little scarf looks so pretty too. I do like the skirt in your collage! Thank you so much for arranging the pen pal exchange, I can only imagine how time consuming it is. I work in a tiny little office and we aren't having any meetings or anything on Friday, so no dressing up for me. I'll pop over to the union at lunch time though for a bun, there's always a bake sale on. 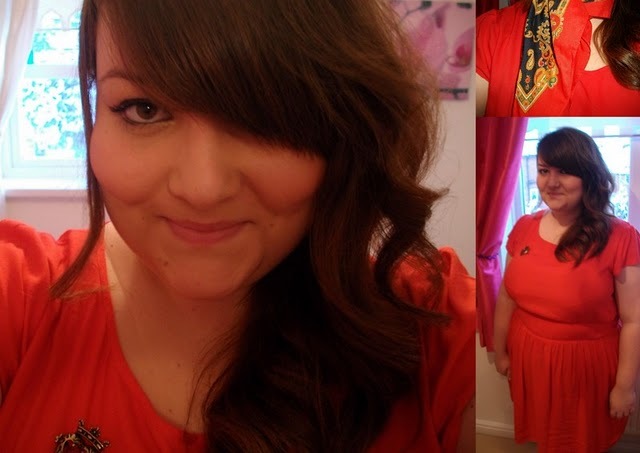 Have you checked out my post for #WearItRed on Friday? Is the dress you're wearing from ASOS? It looks like the black one I have, so in love!